They could be displaced for a month or more as trillions of gallons of rainfall drain away. HOUSTON — Harvey has driven nearly 35,000 people to emergency shelters across Texas, including 10,000 who were holed up in a downtown convention center Wednesday waiting out the extensive flooding that has paralyzed this city. Six days after the storm made landfall south of here, people continued to stream into the George R. Brown Convention Center and spilled over into other shelters as residents were forced from their homes because of record-setting rain and the resulting floods. The displaced milled in large halls and corridors, a somber and impatient crowd that officials said could be out of homes for a month or more as the low-lying city empties trillions of gallons of rainfall. John Boyce, a 49-year-old cabdriver, fled his home over the weekend. He went from a rescue boat to a truck to a hospital, where he traded his soaked clothes for paper scrubs, and then by bus to the convention center Monday morning. There, he received fresh donated clothes, a blanket and a cot. His life now is a lot of waiting. “Wake up, stand in line to get breakfast, stand in line to brush your teeth, stand in line to use the bathroom, stand in line to do something with FEMA, stand in line for lunch,” he said as he stood in line for a lunch plate of spaghetti with meat sauce, salad and steamed carrots. He applied for Federal Emergency Management Agency aid and figured he’ll leave town to live with family in Dallas or Alaska. As soon as he can. A huge population has been sheltered, clothed and fed in scores of shelters across coastal Texas and Louisiana, and that population has been growing precipitously as reservoirs have overflowed, rivers have swelled to record crests and towns have been overwhelmed with water – some to the rooftops. “This is so big we can only compare it with Katrina, and it’s heads and tails above Katrina,” said Holly Brundage, 64, a disaster mental health worker with the Red Cross who also aided with Katrina evacuation in Mississippi, referring to the large number of displaced from Harvey and what she considers a far more organized response. Inside the convention center, throngs of volunteers register evacuees, administer light first aid, serve food, sort clothing, distribute supplies and usher crowds amid a heavy presence of Houston police and state troopers. There is a children’s playroom full of toys and sleeping areas for families, men and women. 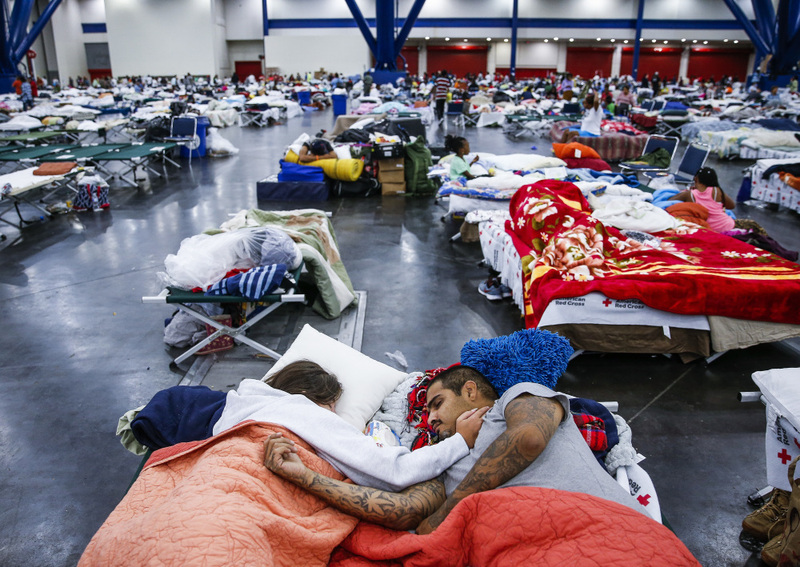 A mega-shelter sprang up overnight Tuesday at the NRG Center, south of downtown Houston, after local officials became frustrated with overcrowding and delivery delays at Houston’s other shelters. By Wednesday afternoon, 900 people had arrived, and nearly twice as many were expected by day’s end. At a glance, it seemed to have everything that someone with nothing might want: a pharmacy counter built of plastic crates, a doctor, kennels for pets, a hot kitchen. And most of all, space – thousands of empty chairs at empty tables, and cavernous halls around clusters of beds.